The original bio-live drink. British milk & live cultures. No refined sugar added. Our Raspberry Kefir Smoothie is a delicious cultured milk drink made with the highest quality British milk and authentic live kefir cultures, with only raspberry purée added. The original bio-live drink, our Kefir is naturally packed with billions of gut-friendly bacteria and contains 7.5g of protein per portion. It is high in calcium and a source of essential vitamins (including B2 and B12) which contribute to the normal function of the immune system, metabolism and reduction of tiredness. Kefir also improves lactose digestion. Free from any artificial colours, flavours or preservatives, our Kefir Smoothie is also gluten free and has no added refined sugar. Nutritious and light, it is a great on-the-go breakfast, a perfect snack or a wholesome dessert. Enjoy the luscious, elegant taste and silky smooth texture. Kefir is a 2000 year old bio-live drink from the Caucasus Mountains that is enjoyed by millions of people across the world. 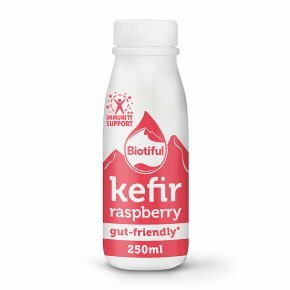 Bio-tiful Kefir is made at a dairy in Dorset from the highest quality local milk and live cultures, and blended with raspberry and fruit. It is delightfully refreshing and nutritious. Shake well before opening and consume within 2 days. Enjoy at breakfast or as a perfect snack anytime... as a drink or poured over cereals and fruit.